Composed by David Conte, Premiered by Ken Cowan. Program notes, composer and performer bios. Copyright ©2004 by the American Guild of Organists. 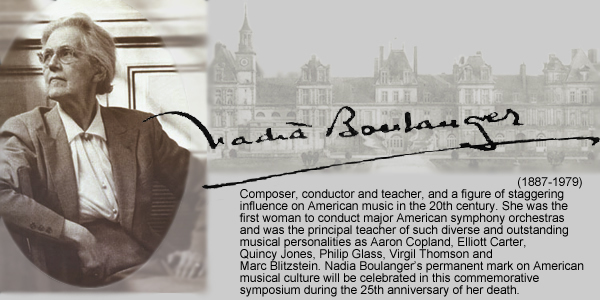 "In the forty years that have passed since I first met Nadia Boulanger in Fontainebleau in the summer of 1960, I have continued to be astonished at her penetrating and far reaching influence on music today. Our styles in pedagogy, our techniques in composition and the computer as a notation master have all changed and modified the way we connect composition with performance. Nadia Boulanger and her remarkable lifetime of 93 years still can direct students of future generations to the remarkable pedagogy necessary for skill development and brilliance in this century..."
This is a growing library. Please check back for new material.